The gnome-system-monitor package preinstalled with Ubuntu 18.04 appears to have a problem with excluding /dev/loop* mounts from the File System tab. Attached is a screenshot of what it shows on my system. 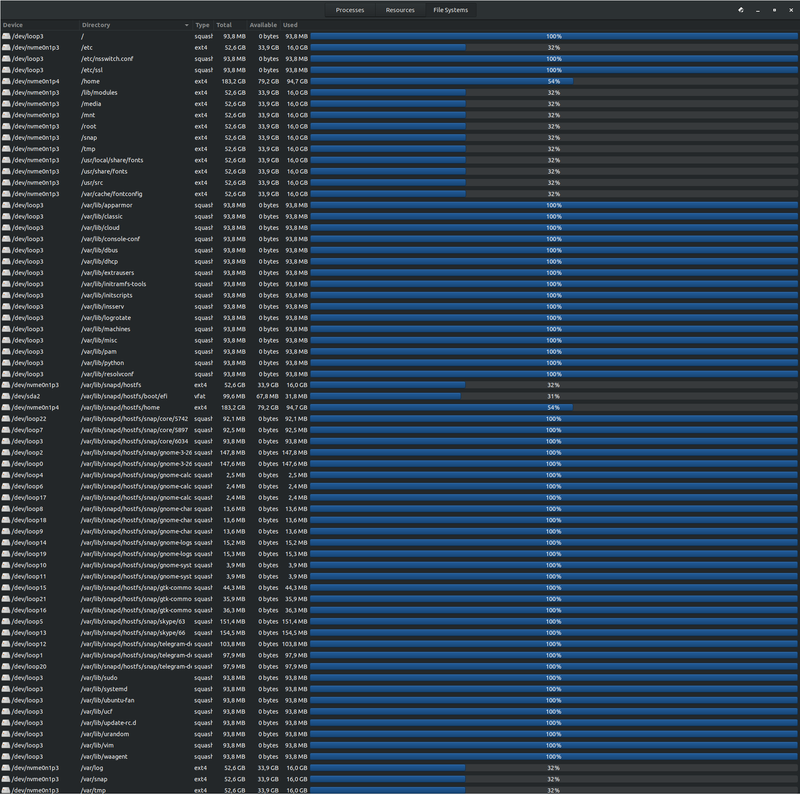 As you can see, there's a lot of /dev/loop* entries, and a lot of duplication of available disk space percentage. If your version of gnome-system-monitor is the default installed with Ubuntu 18.04, you should already have this problem. If not, try removing the current version sudo apt remove gnome-system-monitor, and installing it from the snap store sudo snap install gnome-system-monitor to have the problem show up. It could be helpful to look into $ cat /run/mount/utab (I'm mentioning this only because it was suggested to me to mention it). Unfortunately I didn't do that before removing the snap package, so I don't have the output available. I would expect to only see the actual partitions in my system, in my case: /, /home, and /boot/efi, since I have /home`on its own partition. A workaround to get rid of this problem is to remove the snap package and install it via apt sudo snap remove gnome-system-monitor && sudo apt install gnome-system-monitor. It worked for me, and after that I only had the three partitions mentioned above showing up in the File System tab.